A lot of AAI guides have spent time working in Antarctica over the years. These include Tom Kirby, Alasdair Turner, Dylan Taylor, Tim Connelly, and Danny Uhlmann, among others. Some guides have worked on Mt. Vinson, but most have spent time working at Antarctic bases. One of the most popular films in all of Antarctica is the 1982 John Carpenter film, The Thing. People who work in Antarctica literally love that movie. They often watch it when they arrive on site. And those who winter down there always watch it right before the last plane leaves for the season. The Thing has had a lot of lives on the big screen. First, there was the 1951 film, The Thing from Another World. Then there was the 1982 remake, where they dropped "from Another World," from the title. 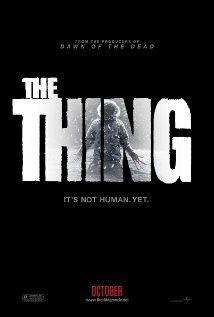 And then lastly, in 2011, they made a prequel to the Carpenter film, also entitled, The Thing. If you're not familiar with the mythology behind The Thing, it goes like this. A crew of Norwegian scientists find ta massive spacecraft buried in the ice. They retrieve the body of something and bring it back to their base. The 1982 film starts with a crew of Americans finding the burned out remains of that base and also finding the thing that caused the death and destruction there. The 2011 prequel tells the story of the Norwegian scientists who find the spacecraft and retrieve the body of an alien frozen in the ice. They bring it back home and realize -- much too late -- that it is not dead. And indeed, that not only is it not dead, but that it is a murderous thing that has the ability to mimic people. The scientists secluded in the Antarctic are picked off one by one by the monster, while never knowing whether their friends are still their friends, or whether they are monsters disguised as people. The 2011 film is a fun B-movie style ride. It is not as tightly written as the super-popular 1982 film. And indeed, sometimes it feels a little bit too similar to that film. The storyline is quite similar: scientists, Antarctica, monsters, ice, impostors, everybody dies... And maybe that's what makes it fun. One of the most terrifying moments in the film for our readers is an early moment where a a large truck drops through a snow-bridge into a crevasse and gets wedged between the two walls. Unfortunately, the filmmakers decided to skip over the rescue of the truck's passengers, which is too bad, because regardless of the monsters running around, getting wedged into a crevasse is not a good thing and would have created more drama in the story. These films are attractive to climbers because they take place in an environment that we are familiar with. While most of us haven't spent significant time in Antarctica, most of us have spent a lot of time secluded in the snowy mountains, somewhat cutoff from the rest of the world. As a result, of our experiences in these places, some of us might find them more spooky than our non-outdoorsy friends.